Visit our Orenda Directory for Orenda photos and current hometown for each of our classmates, with links to the Memory Album. Please vist our In Memoriam page for known obituaries of deceased classmates. 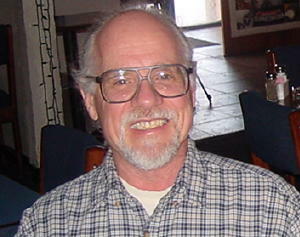 "I am retired from teaching, but tutoring Latin and English. fun. Christmas at our house in Bellaire this year with all. Blackledge, Michael A. 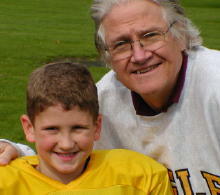 See Mike's memories and photo in the Memory Album. The book "On Our Own, Together: Peer Programs for People with Mental Illness"
(that I have been working on for about six years) was published in March 2005. More info is on the publisher's page:  http://www.vanderbilt.edu/vupress/clay.html. A coupon for a 33% prepublication discount may be found at my website. year then moved into computerized scoreboards and then sports television. I spent four years in the Navy with VP-26 stationed in Brunswick, Maine. found the first ship leaving Cuba with missiles on board. I have led a full life and a wonderful life. After high school I joined the Navy and became a navigator on a personnel transport that traveled between San Diego and Vietnam. Then on to college at the University of St. Thomas in Houston, Texas. I received a BA degree in accounting. Went to work for Ethyl corp. in Houston. Then was recruited to join Amerada Hess Oil Co. at their refinery on St. Croix, USVI. Spent 5 years on the island and was then recruited by Berry Petroleum Co. in Taft, Ca. While at Berry, I was the VP and CFO. I also served on the city planning commission and became Mayor of Taft for two terms. "I've been quite active with a number of projects lately including the Texas eLearning Initiative created by the Texas Legislature. We're identifying Technology Issues in public education in preparation for the Texas Legislature's upcoming Special Session on Public School Finance. "From a business and professional perspective: I'm deeply involved with several strategic planning and implementation initiatives as disparately related as geo-political intelligence and an investment fund targeted to university endowments and trusts-foundations...with several in between." Photo: Jon with his wife Cheryl, Vice President for Education of Questia - the world's largest online library. "She came to this role after a brilliant performance career in Opera and Sacred Oratorio - with an eight year stop as Dean of the Petree School of Music and Performing Arts in Oklahoma City. "Cheryl and I are expecting two granddaughters in July (2004) which will bring the total to six girls and four boys. We have four Australian Shepherds which keep us company on the ranch." "Life has blessed us beyond all hope and expectations and we can't wait to see everyone at our upcoming Reunion. 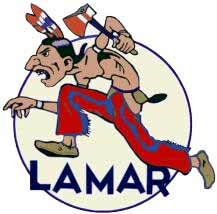 Go Lamar!" I have been living in an old five bedroom house in Raton, NM (on Colorado border) for the past ten years, before that in Farmington, NM. Working as an artist. I also have a make-shift studio in Albuquerque, as I frequently visit my girfriend Elizabeth who makes silver jewelry. I do various types of art work, relying mainly on scenic watercolors for positive cash flow. My heart is in my surrealistic and allegorical paintings in oil, with which I expect to climb to greater heights economically and in interest to the public. 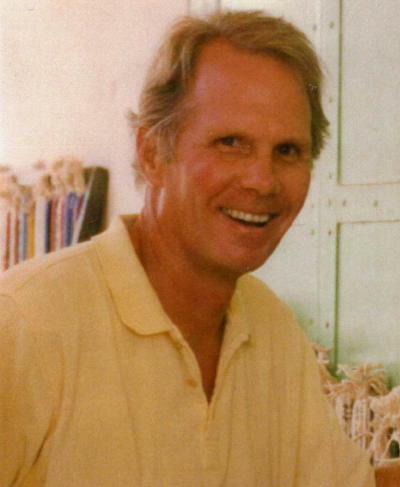 "From 1959 to 1969 I participated on expeditions in Mexico, Central and South America, the Carribean, and the South Pacific, pursuing my interests in geology, paleontology and archeology. During the mid- to late- 1960s I worked at the Smithsonian and Carnegie Institution, while studying geology at American University and Johns Hopkins University. In 1966 I met Judy Carr from Seattle and in 1968 we were married in Washington D.C. We soon were blessed with two daughters, Justine and Spring, who now live in New York City and San Francisco respectively. "From 1971 to 1978, we lived in Addis Ababa, Ethiopia, from which I conducted explorations in Ethiopia’s infamous Afar Depression, which lies at the southern end of the Red Sea and the northern end of the East African Rift. There I discovered a number of fossil sites that have produced a stream of early human ancestors dating to nearly six million years old, and perhaps the oldest stone tools known dating to at least 2.5 million years. Jon's book, "Adventures in the Bone Trade" is available through his web site. or any major on-line book store. Tish with Grandkids: Sarah (3) and Arturo (1) in the Easter outfits their grandma made for them! Oh, those Lamar Home Ec courses do pay off ! I'm still a practicing CPA in Houston. Probably the most interesting career stretch for me was auditing Howard Hughes' books. I spent many an hour in the the cages and pits of Las Vegas in the "old days" 1968-1974. But then again, how many people do you know that have accounting or insurance for a hobby? 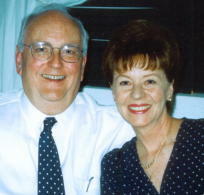 I've been married to Gwen Davis Lilliott since 1963. We met in Yellowstone Nat'l Park between my sophomore and junior years at Rice. Gwen is a Wyoming Prep and U of Wyoming graduate and a practicing medical technologist at Memorial-Hermann Memorial City Hospital. 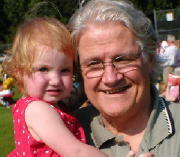 We have three grown children (6 degrees among the three) and two granddaughters. 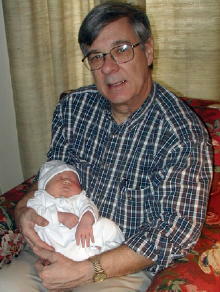 Picture of me is in December 2003 with my younger granddaughter, Julia Madden Chapman, who is Barry Madden's great niece. I have enjoyed life in Washington DC since 1972 when my husband and I moved here, I to teach, he, to work in architectural preservation. Now, a widow, I still thrive on the excitement of Washington politics, arts and museums, and sports - though cable TV gets most of my money because of my addiction to the Rockets and Astros! …I must be a masochist!...Surely Roger will break the spell. I am in Houston often for most holidays to see my wonderful mother and dad who still live in the house we bought when I was a senior at Lamar (Betsy and Bette always said I lived “across the tracks”!) and to watch my nephew set 9th Pole Vault records at Memorial High School! I am a VERY biased aunt! My life has been blessed by a wonderful, smart, handsome son and a career as a teacher. I have loved every minute teaching high school kids about the power of language, the thrill of writing a piece that “satisfies” the writer and moves another person, the joy of reading a book that introduces other worlds or new ideas. I have been fortunate to be involved in many areas of staff development so that I have spent almost as much time working with teachers as I have spent working with students. I served as an English department chairperson in a high school of three thousand students and now am finishing my career in a “second chance” alternative school of three hundred…a job which turns me gray and keeps me young at the same time. I spend time reading, traveling, taking photographs, writing poetry, following baseball and basketball, and loving music. Philosopher, Poet, and Connoisseur. Celebrated International Jewel Thief and Cat Burglar, bon vi bon, Weapons Broker, Trained sniper, Lover of Beautiful Women (Widows Consoled), Adviser and confidant to Kings, (especially the King of Norway) Potentates, Popes, Patriarchs, the Archbishop of Canterbury, Heads of State, (including selected Emirs of the United Arab Emirates) and the International Intelligence Community. Whiskey sampled, Prize fighters trained, Cattle rustled, Revolutions planned, bar rooms cleared, Assassinations plotted, Strikes broken, butts kicked, names taken. Please check this list of Missing Classmates - can you provide information on any of these individuals? Our current list of deceased members for the Class of 1959 can be found in PDF format here; known obituaries are added here. The Lamar '59er's Lunch is currently held at Marathon Oil Bldg. Cafeteria, 5555 San Felipe at Yorktown, Houston. Underground parking available. These lunches are held on the first Thursday of every month, so plan ahead..... Please pass this info on to any of our classmates that you may be in contact with. both were contributed by Lee S. Keding. Dateline, La Madeleine's Restaurant: This group of 59ers was found in November 2003, already thinking about the 45th reunion in April 2004 ! 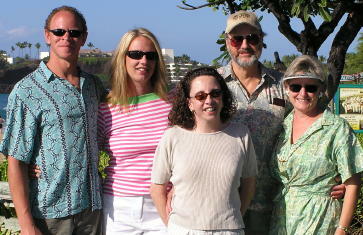 From left to right: Wendell Mendell, Jim Jennings, Rick Lilliott, Kathleen Much, Gwen Lilliott, Carol Childress Turner. Last updated on 21 November 2009.